Shaolin Single knife is an important part of Shaolin Kung fu, a total of 6, each have different names, is composed of the Shaolin boxing Zheng Zongdi twenty-eight generation master, "iron shod seismic sea" called Mr. Yang Xiushan (1885-1949) message. 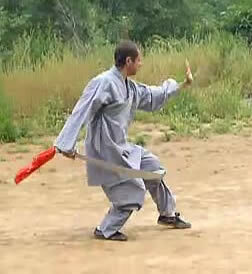 Shaolin way single pole, called "out on potential", is the Shaolin single knife entry blade, the rest of the knife blade evolved. The blade moves fast effective, simple and practical, collapse, cut, cut, pick, sprinkle with fitting method, flexible and changeable, is extended to Shaolin boxing arm, therefore only practice Shaolin (work) to lay a solid foundation to practice boxing, Shaolin broadsword, while Shaolin single knife for the research of ancient Shaolin Boxing, provides real information on rare.